Religion and Morale: Freedom of Religion and of Religious Belief is part of the doctrines included in the US Government’s philosophy. It must therefore be extended to the soldier and proper respect extended to his personal religious convictions. Apart from the different field agencies chiefly responsible for morale in the United States Armed Forces, such as the “Special and Information Services”, the “Public Relations Section”, and the “American Red Cross”, there was the “Chaplain Corps”. The religious and spiritual welfare of the members of a command is an important factor in the development of individual pride, morale, and self-respect, essential in a military organization. The Chaplain promotes Morality and Religion. Duties of Chaplains are analogous to those performed by clergymen in civilian life. The Chaplain is charged with the above responsibilities, while he conducts routine religious services, and attends as a matter of course to Baptism, Marriages, and Funerals; his most important work lies in the close and personal human contacts which he enjoys throughout a command. 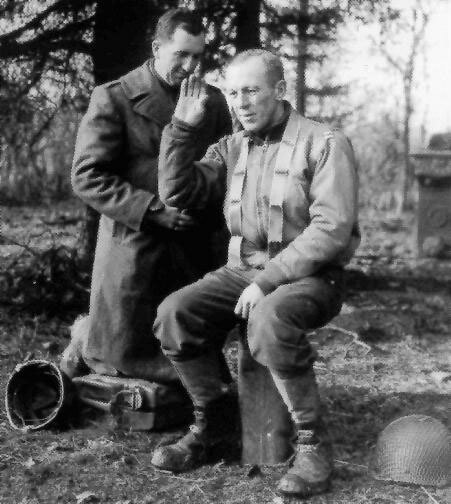 Although Chaplains presented the mandatory Character Guidance lectures and Venereal Disease talks, their counselling sessions were the most valuable – they were present everywhere, at training sites, rifle ranges, mess halls, road marches, gas mask drills, jump towers, ship drills, boot camp, medical training, etc. Chaplains were attached (or assigned) to separate units, such as Battalions, Regiments, Divisions, higher units and larger installations. They were also often assigned duties pertaining to the Medical Department and the Graves Registration Service. During WW2, Chaplains worked in Hospitals, at Embarkation Ports, in Stockades, on Troop Ships. They simply ‘were there’, and many felt their rightful place was with the dying – Chaplains were often killed giving last rites! In the frontlines, they suffered from overwork, terror, and exposure to danger. As Chaplains were limited in numbers, interfaith cooperation was the rule, often, a sole Chaplain would serve all personnel and minister to other faiths. A “US Army Chaplain School” was created out of need to adequately train Chaplains to staff the large American Expeditionary Force, the United States was creating in 1917 for service overseas (as far as known, the very first Army Chaplains took service in 1849). After the W.D. approved the plans, courses were started on March 3, 1918, at Ft. Monroe, Suffolk, Virginia. To supplement the School activities in WW1, a subsidiary “Chaplain School” was created in France (summer of 1918) and located near A.E.F. Headquarters at Chaumont. The “US Army Chaplain School” temporarily suspended its operations January 16, 1919, but was reactivated at Cp. Grant, Rockford, Illinois, in April of 1920 – this coincided with the creation of the Office of Chief of Chaplains. Ft. Leavenworth, Kansas, became a fixed home in 1924, where the School was to remain the next four years. With the advent of WW2, the School was reactivated February 2, 1942 (though it had never officially been inactivated) at Ft. Benjamin Harrison, Indianapolis, Indiana; it later moved to Harvard University, Cambridge, Massachusetts, and finished World War 2 at Ft. Devens, Ayer, Massachusetts. 8,183 Chaplains graduated from the School in WW2. During the period 6 April 1917 > 11 November 1918, a total of 2,364 Chaplains were commissioned in the three components of the United States Army. Of these 5 were killed in action, 6 died of wounds, 12 died of disease or accident, and 27 others were wounded in action. The following decorations were awarded to Chaplains during the Great War: 5 Distinguished Service Medal – 23 Distinguished Service Cross – while 57 Chaplains were decorated by the Allied Nations. The Chaplain’s official status was in fact only granted in 1926, when Congress guaranteed Chaplains, the rank, pay and allowances of grades up to and including Colonel. They now had the right to wear distinctive insignia, i.e. Latin Crosses or Tablets with the Star of David on their service coat lapels, and obtain ‘special’ Chaplain outfits and accouterments. World War 2. Recruiting Chaplains for the US Armed Forces was one way for disciplining and sustaining the morale of the military personnel altogether. Recruitment, however caused several problems since clergy could not be drafted, and the military (by law) had to rely on the various religious denominations and their ordination and licensing councils to do the recruiting for them. Many people at the beginning of the war (and certainly before the Pearl Harbor attack), opposed the war, considering it contrary and repugnant to their conscience. This also applied to the medical community, yet gradually more people became convinced that it was crucial to keep bodies fit and repair any physical damage caused by combat. This also applied to saving and restoring the spiritual damage caused to servicemen and women. 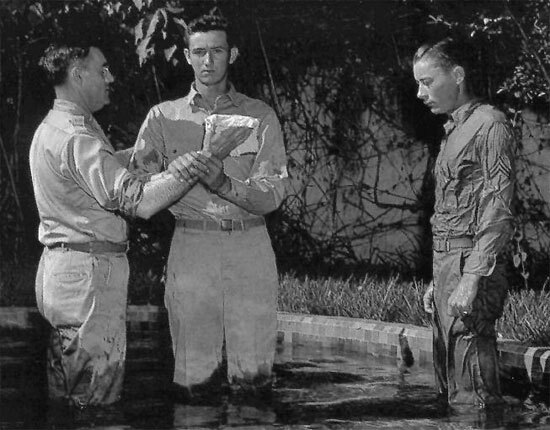 Pacifism and a general antiwar sentiment affected the recruiting of Chaplains for the Armed Forces, and by December 7, 1941, the Army only had 137 Chaplains on active duty and the Navy 105. In the wake of the Japanese attack, there was an impressive display of patriotism, and many wanted to volunteer for military service ! The US Armed Forces required (with only few exceptions) a 4-year college degree and 3 years of seminary education, with the military demanding (desirable but not mandatory) an additional year of pastoral ministry, if possible. While recruitment and procurement were more streamlined for Roman Catholics and Jews, the proliferation of Protestant, including Evangelical and Fundamentalist Churches caused more difficulties. The limited number of African-American Chaplains was mainly caused because black and rural congregations represented the economically weak and disadvantaged people, especially in the south of the United States, with few of these pastors having college degrees or seminary training. Consequently they could only supply limited quotas of Chaplains. Being frequently without the benefit of Chaplains, African-American soldiers (thus lay preachers) often requested permission to organize preaching and Bible teaching meetings among their unit members in order to provide for some kind of worship services. Ultimately, because of a shortage of clergy personnel among colored units (the US Army was segregated –ed), white clergy from both middle and upper classes served African-American military personnel entering the Armed Forces. Another important aspect of preparation for service with the Armed Forces was that Chaplains’ Schools recommended and prepared Chaplains to minister to men and women of all faiths. Chaplain Schools organized classes for clergymen. The Army training program consisted of 6 weeks, while the Navy program represented 8 weeks of courses and lectures. Upon graduation, US Army Chaplains were commissioned First Lieutenants, while those of the Navy were commissioned Lieutenants, Junior Grade. Based on general requirements for the Armed Forces, the following quotas were specified: United States Army – 1 Chaplain for every 1,000 personnel; United States Navy – 1 Chaplain for every 1,250 personnel. In battle, Chaplains like Surgeons and other combatants, frequently worked long days and nights without sleeping, facing ever-growing needs to serve the troops. They not only moved from one unit to another, praying for men and passing words of encouragement, they also assisted medics and corpsmen by providing emergency care to the wounded. Chaplains offered assistance carrying fallen soldiers to the hospitals, and many times devoted countless hours to listening to the last words of dying men who could no longer be helped by Surgeons or other medical personnel. Providing religious services, praying with the living, attending the wounded, assisting the agonizing and the dying, Chaplains sometimes even took up additional responsibility by helping identify and bury the dead, when insufficient Graves Registration manpower was available, and they even dug graves. The emotional strain on Chaplains (not really soldiers), medics, and corpsmen, who relentlessly attended the wounded, dying, and the dead, caused mental and psychological pain to all! During WW2, the Chaplain Corps, continued endlessly to minister to the broken, hurting, guilt-ridden, and grieving members of the Armed Forces, always “serving God and Country”. A male citizen of the United States. Between the ages of 23 and 34 years. Regularly ordained, duly accredited by, and in good standing with some religious denomination or organization which held an apportionment of Chaplain appointments in accordance with the needs of the service. A graduate of both 4-year college and 3-year theological seminary courses. Actively engaged in the ministry as a principal occupation in life and be credited with 3-years’ experience therein. (Officers in the Reserve Corps could also be appointed based on some additional qualifications). 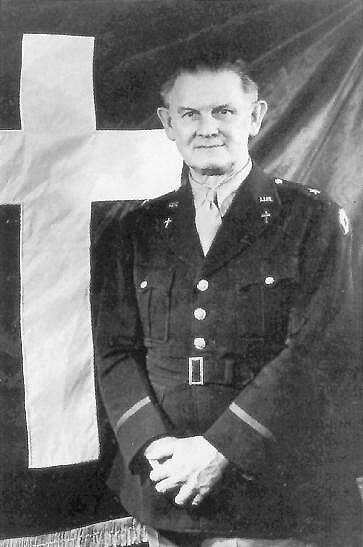 During World War 2, Major General William R. ARNOLD was Chief of Chaplains (Roman Catholic), with Brigadier General George T. Rixey, as Deputy Chief of Chaplains. The Office of Chief of Chaplains consisted of following subdivisions: Control Division – Office Management Division – Technical Information Division – Technical Division and Planning & Training Division. There is no doubt that the tragedy of War and its accompanying suffering and misery has awakened in our Chaplain Corps a new spirit of zeal and sacrifice in the service of God, and has certainly awakened in the hearts of our men a keen appreciation of the value and consolation of Religion. As a result of this, a new consciousness should be evident in all who have had part in this War, and there has also been a noticeable breaking down of bigotry. Both of these qualities should be a lasting blessing to our Nation – Good coming out of Evil. Army Regulations 600-35, 600-38, and 600-40 provided the necessary rules governing wear of the uniform as officially prescribed. Chaplains: U.S. – Chaplains will wear block letters U.S. of gold-colored metal, 7/16 inch in height, each letter is to be followed by a period symbol. Insignia will be worn on both upper lapels of the Officer’s Coat, or on the left Shirt collar, when no Coat is worn. 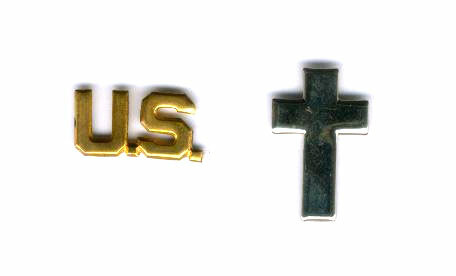 Insignia of Arm or Service – Chaplains will wear the appropriate Branch Insignia, i.e. for Christian Chaplains: a silver Latin Cross, 1 inch in height – for Jewish Chaplains: a double Tablet bearing numerals from I to X, surmounted by two equilateral Triangles interlaced, all silver, 1 inch in height. Chaplains: These Officers will wear a cord edge braid of gold bullion (or metallized cellophane) and black silk intermixed (like other regular Officers). Some Chaplains however, continued to wear the black piping, as used in World War 1 (introduced in 1918). Chaplains did also wear their typical insignia of Faith on the left side of the Garrison Cap (instead of the foreseen insignia grade), while the appropriate ranks were then usually worn on the collar lapels and/or shoulder loops. 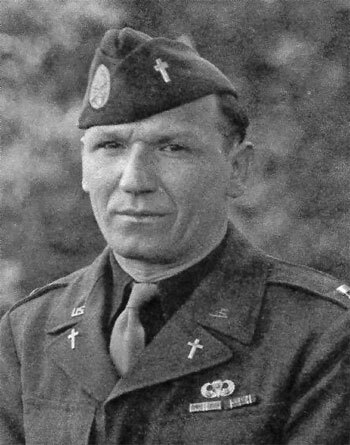 Remark: Christian-Faith Chaplains often had their M-1 Steel Helmet front adorned with a white Latin Cross (painted), a silver metal Latin Cross insignia (soldered), or a small white Latin Cross on a rectangular dark blue background (painted, similar to the Chaplains’ Flag). 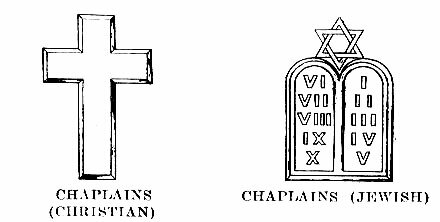 Jewish Chaplains, had similar insignia (Tablets or Star of David). The Officers’ tactical mark, a white vertical stripe of 1 inch by 4 inch, was painted on the back of the helmet. View of Chaplain’s Scarf, Stock No. 62-S-2505 (black with gold-colored embroidery). 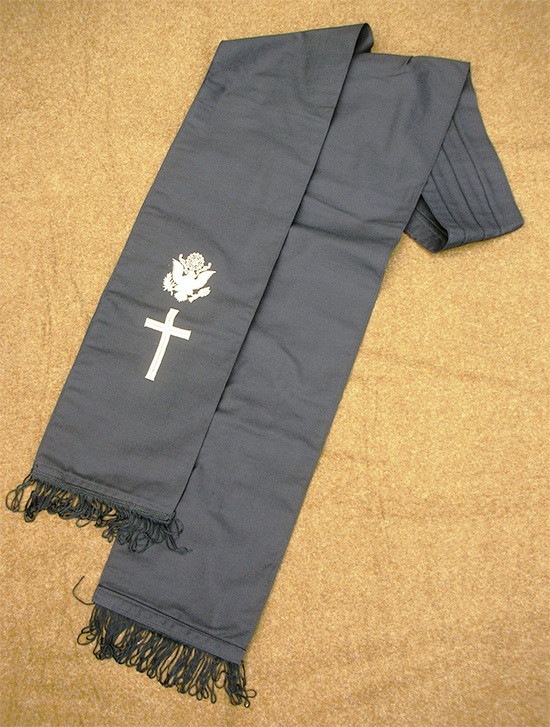 Chaplains’ Scarf: The Scarf was optional issue, but could be drawn from QMC services if necessary. Official designation was Scarf, Chaplains’, Christian Faith, Stock No. 62-S-2505 and it was an expendable item. The Scarf was a standard ecclesiastical pattern, made of black material 9 feet long. It was embroidered on each end with a gold-colored Coat of Arms of the United States and with the Chaplain’s Branch Insignia (spaced ½ inch below the Coat of Arms). The Jewish-Faith Scarf had similar dimensions and appropriate insignia, it was white or black. 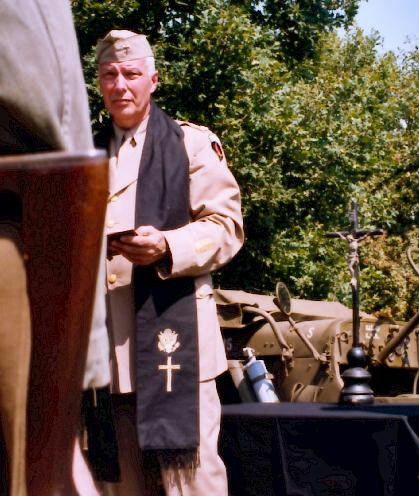 Some Chaplains also used Ribbon Stoles (worn around the neck, or knotted around left arm), these items were often private purchase, provided by family or relatives, or by their stateside Congregation. Basic colors were purple, lined with white silk, with a length of 4 feet 1 inch, and a width of 1 ½ inch. Christian Chaplain hearing Confession and giving the Absolution. The Chaplain, with Captain rank wears the narrow Ribbon Stole (not official issue). 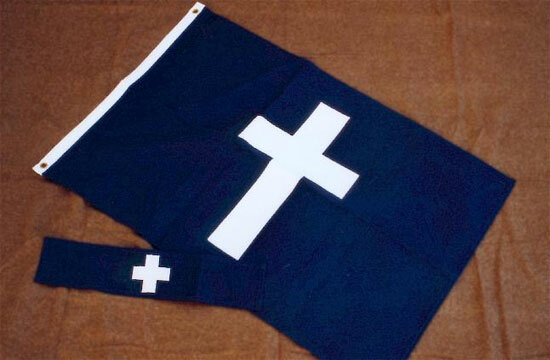 Chaplains’ Brassard: Although not official issue, Chaplains sometimes wore Brassards, of 18 inches in length and 4 inches in width, in colors following the official-issue Chaplain’s Flag, being dark blue wool bunting (not black), with a white Latin Cross. The Chaplain’s Brassard was identical to the Geneva Convention version, except for colors. They were also issued War Department ID Cards, for military & civilian protected personnel, with indication ChC, instead of the regular MC, DC, or ANC indications. As per instructions issued by the Chaplain Section (Headquarters, ComZ, ETOUSA) Chaplains and Assistants exclusively concerned with removal, transportation and treatment of wounded and sick personnel were allowed to wear the Red Cross brassard for protection. There existed another brassard version related to Chaplains, this was the Brassard, Arm, Port Officer, Chaplain – Stock No. 71-B-1352 (colors: QMC buff background with black ATS CHAPLAIN block letters). Chaplains’ Flag: The Chief of Chaplains was issued an official Flag by virtue of Circular 73, dated March 12, 1942. The Flag was made out of dark blue wool bunting and adorned with a white Latin Cross. 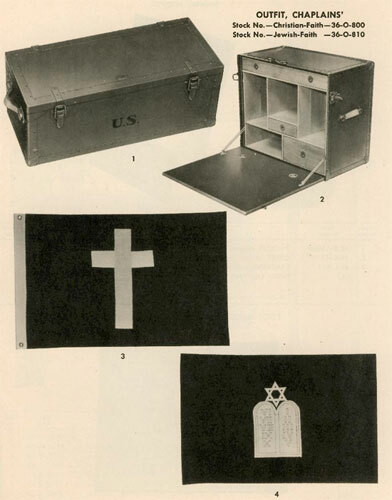 Its dimensions were 2 feet hoist, by 3 feet fly, with a Latin Cross 1 foot, 6 inches in height, and arms 3 inches in width, all centered (Jewish Chaplains had a similar Flag but with the specific Jewish Faith insignia). The Flag is part of the Chaplain’s Outfit, and is described on Page 78 of the Army Service Forces Catalog QM6 – Quartermaster Supply Catalog CHESTS, KITS, OUTFITS, AND SETS – supersedes OQMG Circular No. 4, Headquarters, Army Service Forces, 31 January 1944. Official designation is Flags, Chaplains’, Christian-Faith and Stock No. 5-F-980, while the other Flag is Flags, Chaplains’, Jewish-Faith, with Stock No. 5-F-985. 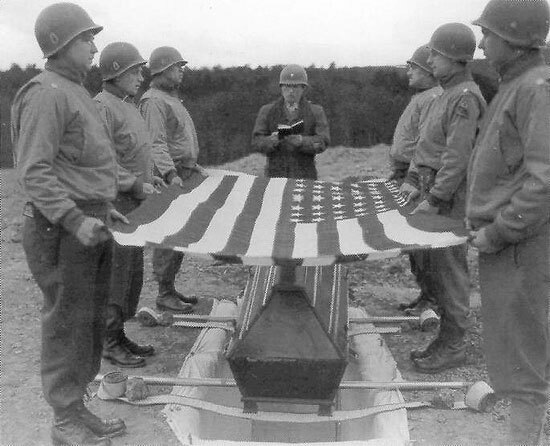 Chaplain Flags were used as authorized by COs to designate time and place of religious service, and in the field to indicate the Chaplain’s quarters (tent or building). For semi-permanent installations or camps, the following equipment was further authorized: 1 assembly tent and 4 tables, folding, with the necessary chairs. It was generally foreseen (depending on local circumstances) that the Chaplain should be provided with a proper office equipped with such appropriate furniture and fittings as needed for his work. This would usually include 1 desk, 2 chairs, a card-filing cabinet and cards, a typewriter and stand, letter files, waste and desk baskets, and the usual accompanying small articles with a supply of suitable stationery. 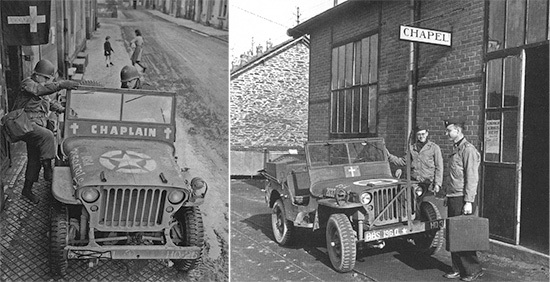 Personal vehicles were often only obtained when serving in large field organizations, such as Armies – Corps – and large Hospitals, and sometimes depended on the Commanding Officer’s goodwill. Typical illustrations of a Chaplain’s 1/4-ton Truck as used in the field. A portable Typewriter was formally a component of the Chaplains’ Outfit, it can be found in applicable T/E or T/A No. 20, Equipment for Posts, Camps, and Stations. Each Outfit component is to be procured, stored, requisitioned, and issued individually. It is to be noted that brass Holy Communion service kits and folding Altars were available to Chaplains, although it was expected that they would be supplied by their religious denominations (TM 6-205 “The Chaplain” does however not mention this particular kit). Bedding Roll, including various articles of clothing and toilet articles. Clothing Roll, which could also be substituted by a traveling bag or a suitcase. Barrack Bag, for use as a receptacle for clothing. Shelter Tent, Complete, part of the field equipment (later on, favorably replaced by a Tent, Wall, Small, standard use for 2 Officers in the field). Blanket, Wool, Olive-Drab, Regulation, a number deemed necessary for comfort according to climatic conditions (from 2 up to 4 blankets). Mattress, usually none, if used very lightweight (a mattress cover was usually taken to be filled with straw or hay, an air mattress or a sleeping bag could also be used if desired). Pillow, usually one or two, lightweight and small. Sheets and Pillow Cases, sheets were often dispensed with altogether, and pillow cases seldom used. Folding Cot, only when transportation was available. Camp Stool or Folding Chair, again only when transportation was available. Miscellaneous articles such as a flashlight, candle or acetylene lantern, alcohol or gasoline stove, small rug, canvas bucket, washbasin, and miscellaneous toilet articles. Supervision of the spiritual welfare of the command. Conduct of religious services, including funerals. Spiritual ministrations to the sick and wounded. Correspondence with relatives of deceased personnel. Coordination of the religious work of the various welfare societies. Supervision and coordination, within limits prescribed by the CO, of the training and work of the Chaplains of subordinate units. Recommendations as to assignments and transfers of Chaplains. Providing the services of Chaplains for units requiring them. Preparation of estimates and allotment of funds for religious activities not specifically charged to other agencies of the command. Preparation of reports relative to religious and moral activities of the command. Chaplains were generally unarmed, yet their assistants could bear arms if necessary for protection. Their status of non-combatants forbade them to participate directly in hostilities, which allowed them to be respected and protected under all circumstances. Chaplains were issued WD AGO 65-10 Certificates of Identity for Military and Civilian Protected Personnel, as members of the Medical Department and Army Nurse Corps. Captured Chaplains were not considered PWs and had to be returned to their home nation unless retained to minister to prisoners of war. Infantry Regiment, Infantry Division: Attached Chaplains numbered three, and advised the Regimental Commander and Staff on matters dealing with the religious and moral welfare of his command. Ranks carried were those of First Lieutenant, or Captain. 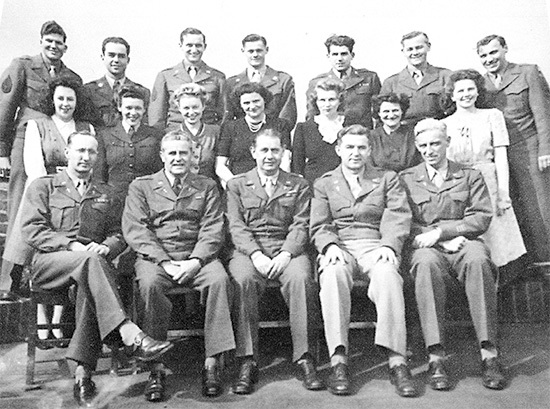 Group photo illustrating 5 Chaplains (front row) taken while training in Southern England (SBS) prior to D-Day. 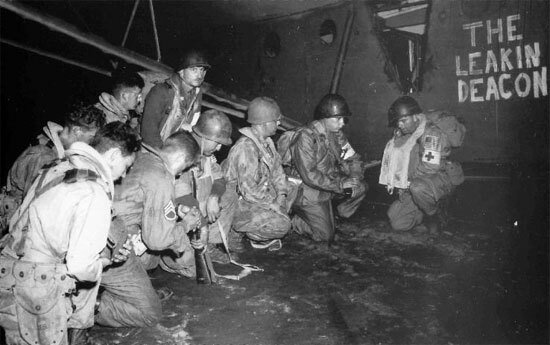 This particular photo belonged to a group depicting 29th Infantry Division personnel stationed in the United Kingdom. Medical Battalion, Infantry Division: One attached Chaplain, member of the special Staff assigned to the Headquarters & Headquarters Detachment. Remark: Chaplains were entitled to assistants, who cared for the Chaplain’s official property, acted as his clerk, and helped with the educational, religious, and general entertainment programs. One enlisted person, mostly a Tec 5, was assigned to assist the Chaplain in the performance of his official duties. 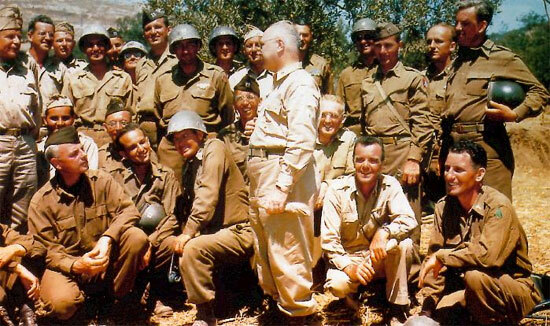 It should be noted, that such assistants did not wear any official insignia connected to their assignment (except those from their unit). It is important to note that Chaplain Assistants, when not involved with sick or wounded personnel, were allowed to bear arms allotted to them as per T/O & E distribution. 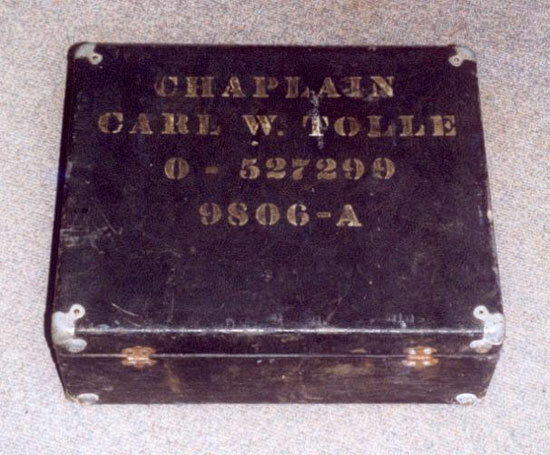 Exterior view of a Chaplains’ Service Kit, containing a portable Altar with Holy Communion set (private purchase). This particular item belonged to Carl W. Tolle, Sr., O-527299 (1910-2005), 7th Cavalry Regiment Chaplain, 1st Cavalry Division, who served in the Pacific Theater during WWII.